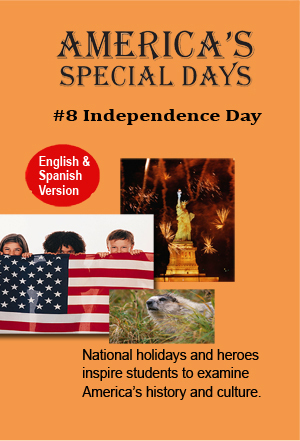 America’s Special Days salutes Independence Day (July 4th), Cinco de Mayo (May 5th) and Seis do Septiembre (September 16th). Our guide, Francesca, takes us to Washington D.C., where we visit the Thomas Jefferson memorial. We also visit with Thomas Jefferson at his home in Monticello. Then we go to Philadelphia to see the Liberty Bell and Independence Hall. Francesca explains some of the symbols of our freedom like the eagle, the Liberty Bell (also on the fifty-cent piece) and some symbols on our money. We visit several Fourth of July celebrations. Mexican Independence Days are celebrated with parades, dancing and carnivals. We join children in decorating for the American Fourth of July.